Need to spread fertiliser and seeds but don't want the heavy work involved. The FI115S will do the work for you. With professional style, easy-set controls for precise application, this spreader is the easy way to care for your lawn year after year. Just attach it to your ride-on lawn mower or ATV with the single pin latch and start spreading. 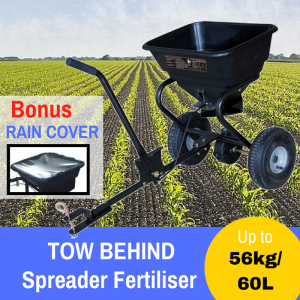 The 250-pound (115kg) tow-behind spreader maintains a wide and smooth distribution of fertilizer while reducing the necessary time, energy, and fertilizer to cultivate your lawn. 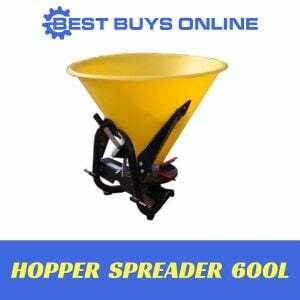 With a strong poly hopper capacity of 250 pounds (115kg), this broadcast spreader is best equipped for use in yards and spaces 45,000 square feet or smaller. Built to make the lives of farmers and rural property owners a whole lot easier, the item can spread fertilizers in various formulations, with different ratios of the ingredients (N,P,K). It takes a wide range of fertiliser and seed types, ranging from powdered fertilisers to course seeds. Designed to improve the material flow and spreading performance, the item comes with hopper screen to cut and filter any unwanted clumps. The broadcast coverage nurtures more natural, uniform grass growth, while limiting the needed fertilizer for an extra ecological benefit. 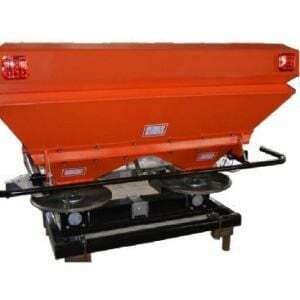 Designed for manual pushing, the spreader also can be used for grass seed in large open areas. 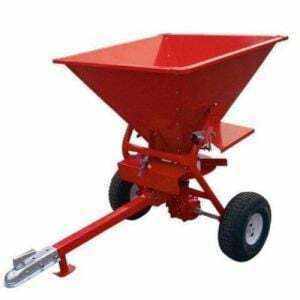 It features a rust-resistant powder coat finish poly hopper and spreader plate to ensures proper operation and resists corrosion for years of service. 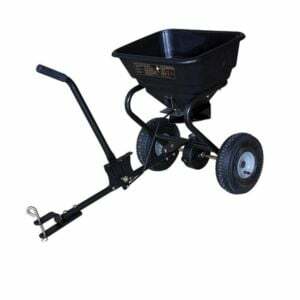 The spreader is towed on two 14-inch pneumatic wheels with universal pinned tow hitch for easy maneuvrablity. With on/off control handle accessible from ATV seat, you will find this spreader easily operate whenever you need to adjust the material output on the go. There’s also a BONUS UV rain cover included, so you can get out and give your lawn a healthy boost even when the weather is bad! 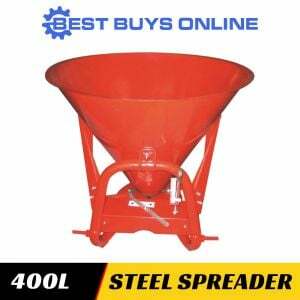 This spreader requires some assembly and comes with a 12-months Limited Consumer Warranty.